The Vedas banquet hall is an upscale, event facility, located in the heart of Sandarshini Inn. 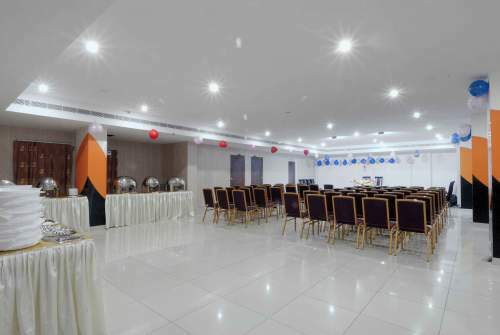 This newly renovated with Capacity of 150-400Pax having Podium, Excellent Sound System, Projector Screen banquet hall is close to everything, easy to get to, offers a charming atmosphere, plenty of parking, a beautiful decor, and a touch of elegance at an affordable price! This decorated banquet room is perfect as a wedding reception hall, great for anniversaries, family reunions, private parties, business functions, awards banquets, Quinceaneras, or anything else the imagination can come up with! We are one of the few banquet halls in to fit YOUR individual needs! Reserve our banquet hall for all your special occasions!